I think it was 1992 when I first spotted Renwick Street. In the summer of that year I was freelancing at a type shop named ModKomp, entered from a loading dock on Greenwich near Vandam. This was still in the era when you pulled long galleys of print, cut them and pasted them on boards; there was a lot more dexterity involved in the print business then. At lunch I would take long walks in the neighborhood. 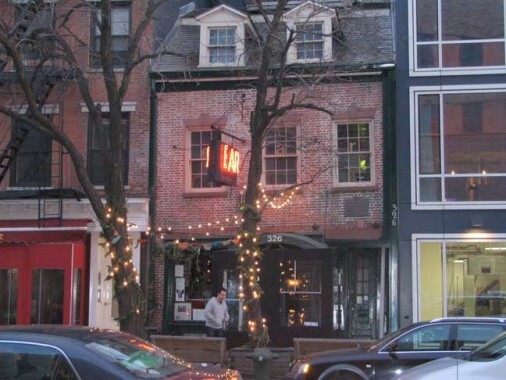 Real estate barons hadn’t yet dubbed the area Hudson Square, so this was a part of western Soho or even the West Village and it was wholly industrial, with the exception of a couple of bars here and there like the Ear Inn on Spring. 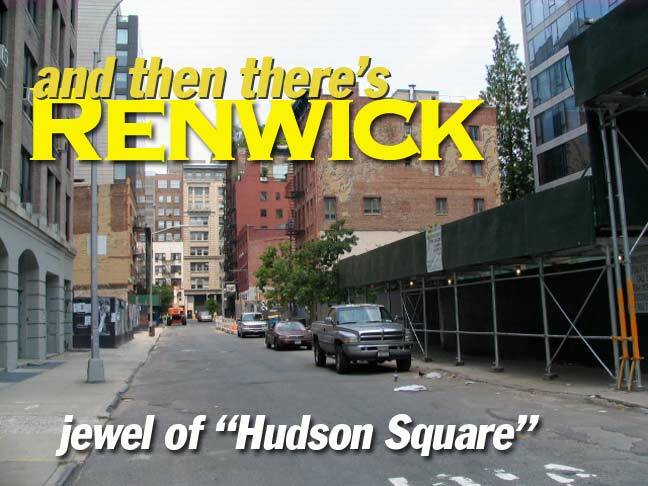 And, there it was, emanating north from the honking cacaphony of Canal and a couple blocks from the earsplitting madness of West… tiny Renwick Street. 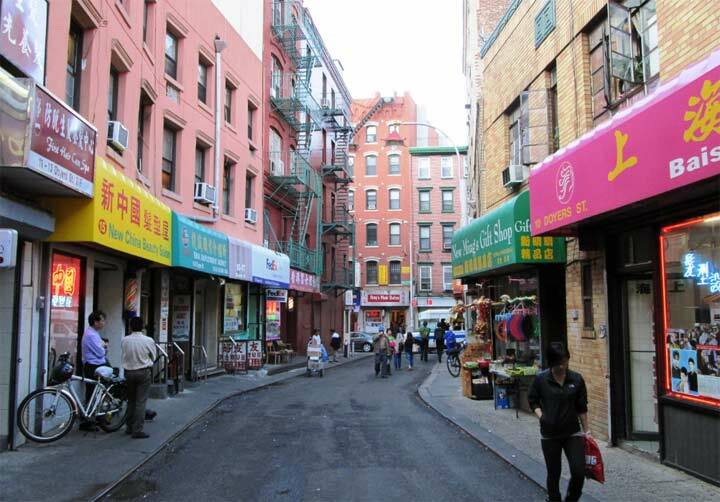 It’s one of an odd trio of one-or two-block streets that run north-south parallelling Hudson and Greenwich. Renwick runs between Canal and Spring, while Staple runs from Duane north to Harrison and Collister runs from Beach north to Laight. 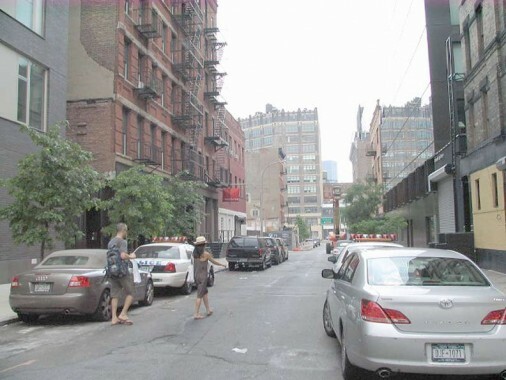 Staple boasts an ancient pedestrian bridge that once connected to New York Hospital while Collister borders on an old American Express stable, but Renwick seems the most nondescript of the three. As we’ll see, it’s about to shed that description. Renwick Street was named for author/engineer/scientist James Renwick (1792-1863), a Professor of Natural and Experimental Philosophy at Columbia College, which was located downtown a few blocks from Renwick’s namesake street at the time (see College Place sign on FNY’s West Broadway page). 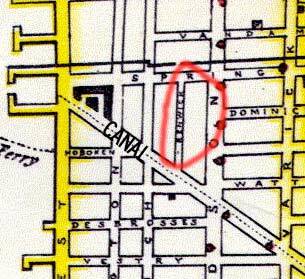 Since Renwick Stret begins showing up on NYC maps in the late 1830s or early 1840s, the street was named for Renwick when he was still alive — quite a tribute. Renwick’s son James Jr. became an architect; he was the mastermind behind St. Patrick’s Cathedral, Smithsonian Institution, as well as the magnificent ruin of Roosevelt Island, the Smallpox Hospital. 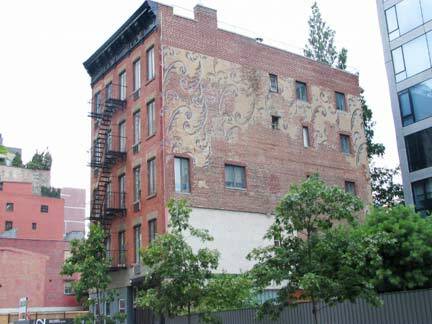 Above: a pair of residential buildings on Renwick Street that were there when I first encountered it. The magnificent paisley-esque design on the building is still there today, though it is soon apparently be going to be covered by yet more development. 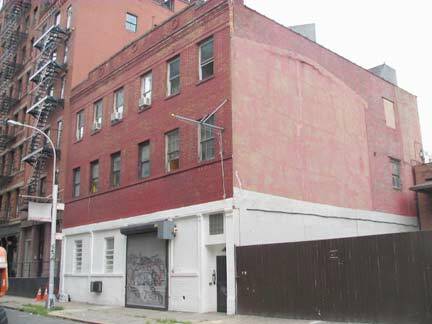 Note the “ghost” of a former building on the right; this building may have been a former stable. 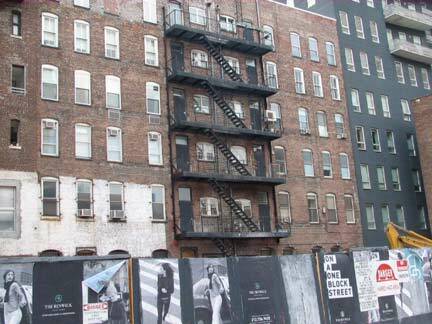 Faceoff: two visions of residential architecture square off on Renwick. 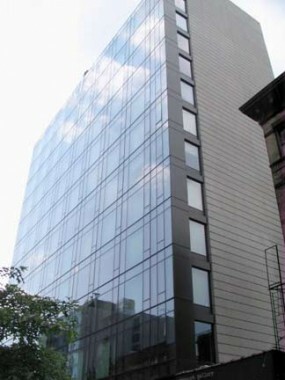 In this corner, red bricks, storefronts, and fire escapes and in the other corner, an impassive wall of glass. 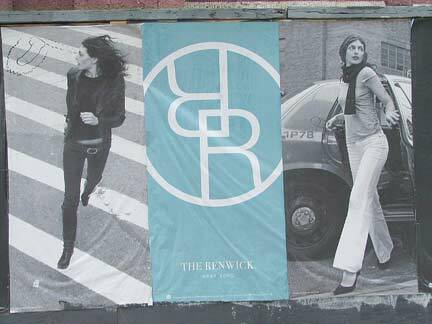 Potential residents of The Renwick were expected to be hip young things who are going places. Local graffitists have already expressed an opinion. 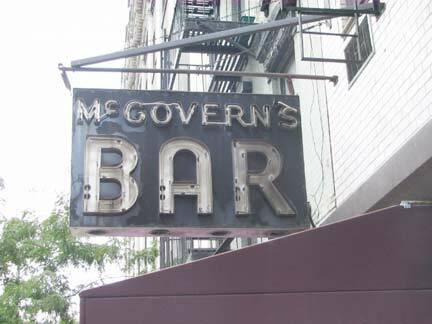 The north end of Renwick, at Spring Street, still bears talismans of the recent past, such as a former dive called McGovern’s. 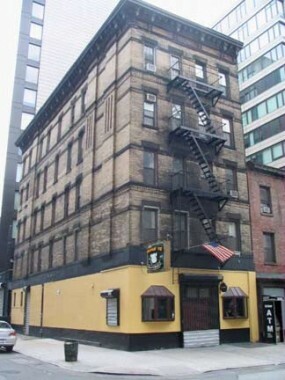 The sign has stayed but it’s now a club called the Sway Lounge, or at least it was in 2008. 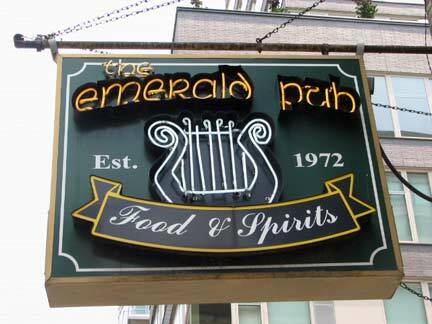 The Emerald Pub still holds firm on the NW corner of Spring and Renwick, in a turn of the 20th Century building now being wedged in by glass boxes. The Man of 1000 Bars visited in 2005. I was in the area so I couldn’t resist going by the venerable Ear, a block away from Renwick, on Spring between Greenwich and Washington. It’s likely the intense development in the area will make it busier than ever. 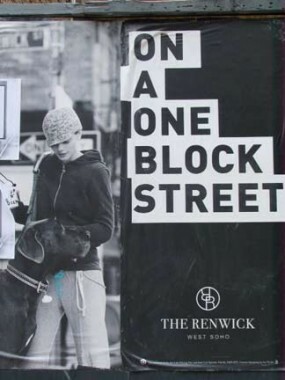 Thanks so much for this insight into Renwick St. 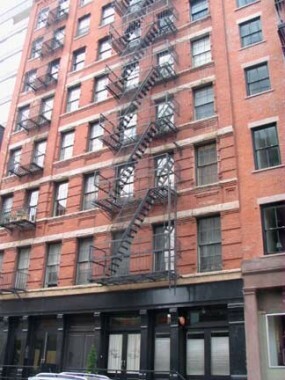 I am researching my family history and I had family that lived at 13 Renwick St. according to the 1892 NY State Census. 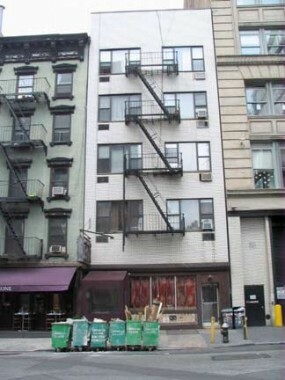 I’m sure it looked quite different then but I can still get a flavor of what it was like from the pictures of the buildings and the old NYFD map. Thanks so much. Thanks. Still a quiet street.